Power generation requires uninterrupted bearing service. The ball and roller bearings for the pumps, compressors, electric motors and drives must meet critical internal clearances, cage designs and Abec precision class. Pillow Block bearings have to be a design that allows for easy and prompt replacement. Special Solution: The Craft Split Roller block allows for rapid replacement to save downtime and costs. We also recommend high end lubricants such as Kluber or Lubriplate for critical locations to better match lubricant service life to bearing B 10 life ratings. Available in both Inch and Metric shaft variations for next day delivery. A generator operating in the nacelle of a wind turbine is subjected to significantly greater vibration loads than its counterpart on the ground. This additional permanent load has a negative influence on the cages and places a strain on the lubricant. In the design of bearings for a generator, it is not only the size and design that play an important role. Special attention must be paid to the lubrication and protection against possible current passage. The bearing arrangement of a generator generally contains a combination of deep groove ball bearings or cylindrical roller bearings.The passage of current in a wind turbine generator can cause serious damage to the raceways of bearings in the form of melt craters and false brinelling. 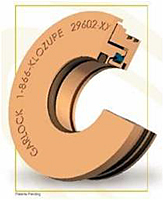 It is advised to use current insulated bearings in many applications. Blade bearings (pitch bearings): In order to control the power output of the wind turbine, the blade angle must always be adjusted to the wind speed via the rotary motion of the blade bearing. Single or double-row four point contact bearings with or without gear teeth on the inner or outer ring are used here. Yaw bearing: A slewing ring is required in order to adjust the position of the nacelle to the wind direction. The wind load and the dynamic inertia forces are transferred via the raceways and the screw connections into the tower head. Single or double row four point contact bearings are used here. Blade adjustment: The rotor angle can be adjusted using electric or hydraulic systems. These use sealed spherical bushings that have corrosion protection.